In addition to developing and reinforcing academic skills, the ACT Boot Camp provided students with the opportunity to experience college life for a week. Students slept in a residence hall, ate in the cafeteria, spent free time in the Wellness Center and the Curris Center, and participated in several on-campus activities. Students also traveled to Memphis, Tennessee, where they visited the Memphis Zoo and the National Civil Rights Museum and finished off the evening with pizza and games at Incredible Pizza Co.
All students who attended the ACT Boot Camp are members of TRiO Talent Search, a federally-funded college access grant hosted at Murray State University. Talent Search provides year-long services to students who meet participation requirements, including income eligibility guidelines and first-generation college student status. Students were required to complete an additional application process for the ACT Boot Camp, which included an essay and a counselor recommendation. Talent Search is currently recruiting new members for the 2018-19 school year. Students who are interested can contact their school guidance counselor for more information. 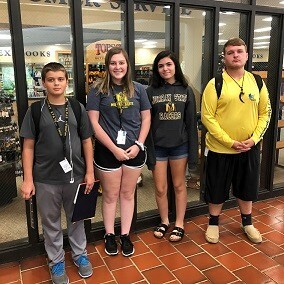 HCHS students attending the 2018 ACT Boot Camp are Matthew Houghton, Lexy Riddle, Jasmine Morales, and Jeffory Powell.